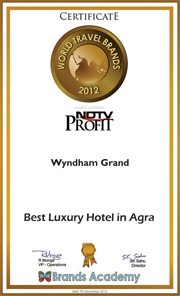 Wyndham Grand promises to make your trip to Agra as memorable as you ever dreamt of. Get yourself indulged in the richness and exquisiteness of Mughal era through our 160 rooms including suites and presidential suites ranging from 340 to 4000 sq. ft. The impressive architecture and beautiful paintings and carvings on walls are breathtaking and remind you of the Mughal era. All our rooms are tastefully designed with rich designer upholstery and linen in matching color combinations. Each room is equipped with bedside control panel that manages numerous services and functions. Every suite embodies unique character & theme with the same rich and grand princely style of living. The finest materials have been sourced from around the globe, coming together in exquisitely designed and crafted interiors. These suites exhibit the royalty and grandeur of a palace. Their sheer opulence in every tiny detail is underpinned with technology that does everything from controlling the LCD in rooms to closing the curtains. To add to it are the highest standards of personalized service. You can experience the exotic comfort in the ultra-luxury Haveli Complex comprising of four presidential suites of 3 bedrooms (3500sq ft.) and 2 bedrooms (2100sq ft.).There are 4 VIP suites of 2 bedrooms (1700 sq. ft.) and 10 single bedroom suites to provide the extraordinary experience. The hotel also offers 16 deluxe suite blocks with state of the art amenities. All current applicable taxes will be charged extra. All room rates are applicable on per room per night basis for single / double occupancy.